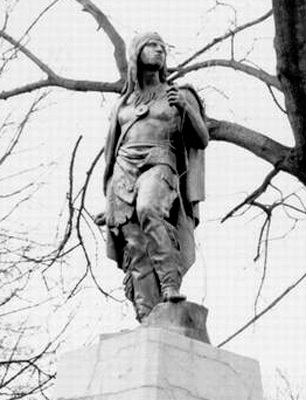 The sculpture commemorates the Lenape leader Konieschquanoheel, and is installed where the Lenape established their camp after they were driven from the banks of the Susquehanna River in Pennsylvania. The site was chosen by city officials who believed it to be an important junction on the Portage Path, an American Indian trail leading from Lake Erie to the Ohio River. The path, however, passed Barberton to the east, near Summit and Nesmith Lakes. Konieschquanoheel, also known by the English name "Captain Pipe" was a prominent Lenape (Delaware) leader during and after the American Revolution. Little is known of his early years. His Lenape name, Konieschquanoheel, means "maker of light." Konieschquanoheel's nickname among the Lenape was Hopocan, which translates to "tobacco pipe." By the time of the American Revolution, Konieschquanoheel had become a leader among his people. During the conflict, he first tried to remain neutral towards both the British and the Americans. He refused to take up arms against the Americans even after General Edward Hand killed his mother, brother, and a few of his children during a military campaign in 1778. The Lenape that Hand attacked were neutral. Later that same year, General Lachlan McIntosh, the American commander at Fort Pitt, requested permission from the Lenape to march through their territory in order to attack Fort Detroit. Konieschquanoheel and other Lenape leaders agreed, as long as the soldiers would build a fort to protect the Lenape form both the British and white settlers. McIntosh agreed and had Fort Laurens built near the Lenape villages in eastern Ohio. After constructing the fort, however, McIntosh demanded that the Ohio Country Lenape assist the Americans in capturing Fort Detroit. If the American Indians refused, McIntosh threatened them with extermination. Realizing how weak McIntosh's force was and believing that the Americans could not protect them from the British and their native allies, Konieschquanoheel and many other Lenape began to form a more friendly relationship with the British. The Americans pushed Konieschquanoheel solidly into Britain's embrace in 1781, when Colonel Daniel Brodhead attacked and destroyed Coshocton, a Lenape village. Konieschquanoheel spent the remainder of the war trying to thwart American expansion into the Ohio Country. In 1782, he participated in William Crawford's defeat. According to popular Anglo-American lore surrounding the event, Konieschquanoheel was probably the one who marked Crawford for death by painting his face black. He also threatened to kill Simon Girty if he tried to intercede on Crawford's behalf. Following the Revolution, Konieschquanoheel continued to resist white settlement of the Ohio Country (known as the Northwest Territory at this point). By the 1810s and 1820s, Konieschquanoheel realized his people had little chance against the Americans and began to negotiate treaties. The whites quickly violated these agreements, moving onto land set aside for the Lenape. The exact date of the death of Konieschquanoheel has not been determined. Some historians have argued that he died as early as 1794. Others believe that he lived until 1812-1814 when his role was assumed by his son who was also called "Captain Pipe."